Few students could claim they not only created their own summer jobs, but built a highly successful business around them. Yet that’s exactly what the Kearney sisters did! The sisters’ entrepreneurial journey began with the search for a summer job after Maura had completed the first year of her course in Bakery Production and Management at DIT ­– a programme her sister, then doing her Leaving Cert, was to follow her into. In the hard-bitten nineties, jobs were thin on the ground, so the enterprising pair decided to do it for themselves: “We bought a mini commercial oven and started baking apple tarts, soda bread and scones which we sold to local shops,” Maura recalls. 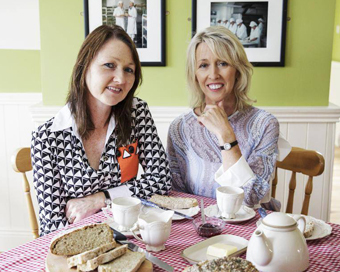 The sisters used their mother Daisy Kearney’s recipes ­– aside from being a world-champion baker, Daisy is also an award-winning Seanchai who has travelled across Ireland, the UK and the USA with Comhaltas Ceoltoiri Eireann. “Mum’s a great baker and that’s definitely where our love of baking came from. “Basically we created a summer job for ourselves! After graduating in 1989 Maura worked in Dublin and later moved to Switzerland to get experience in a bakery. Once Siobhan graduated from DIT in 1991, the sisters hit the ground running. Although some of the bigger bakeries were closing down at the time, the fledgling Limerick bakery was meeting a demand beyond the reach of the big bakeries and their sliced pans. “It was a changing Ireland, when women were not at home as much and didn’t have time to bake. “When people have our apple tart or brown bread they tell us that it’s just like their mother would make. “We still use the ingredients our own mother would have used – Odlum’s flour, Stork margarine, fresh eggs and freshly prepared Bramley apples. In 1991 they applied for a mortgage to build a bakery on the family farm at Tenekilla, Ballyhahill, Co. Limerick. Aware that if their venture failed, they’d be stuck with a useless bakery unit in the middle of the countryside, the duo designed the premises along the lines of a normal house which could be more easily sold if things went wrong! “That was our plan B – desperation really makes you think! In 1992 there was a lot of unemployment and a lot of people emigrating so it gave us great comfort that the design of the bakery would have a dual purpose if required. The bakery opened its doors in June 1992 with Maura, Siobhan and two other full time staff, a figure which has since grown to 22. Within four years the bakery had already outgrown its ‘house’ and a large extension was opened in 2000. “Our parents were always very encouraging and supportive and I give them a lot of the credit for our early success,” says Maura. Siobhan naturally gravitated towards the roles of Production, HR, staff and rostering, while Maura moved into the sales and administration space. “Initially I was our only delivery person, but we now have five vans on the road, delivering everywhere from Limerick to Killarney.” Over the years the company has received strong support from the County Enterprise board in terms of mentoring and education in every aspect of business. It also helped out financially, providing the Kearneys with a low interest loan of “about €30,000” for the purchase of equipment in 2001.